It’s fashion week here in New York City and last week the American Heart Association painted the town red for their Go Red for Women Red Dress Collection fashion show presented by Macys. Thousands of people gathered at the Hammerstein Ballroom in Midtown to raise awareness about Heart Disease. 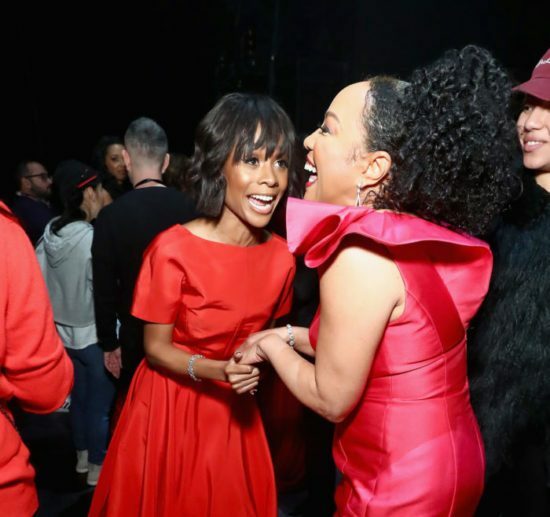 Actress Lynn Whitfield and Zuri Hall, E News correspondent, were among some of the stunning women to take the runway in red designer dresses at the star- studderaising; but they made it clear that it was not about them. For them it was about raising awareness about the disease that kills more women than all of the cancers combined. Vice Admiral Jerome Adams who is the 20th United States Surgeon General and Cardiologist Dr. Nakela Cook, chief of staff at the National Heart, Lung, and Blood Institute were also in attendance to raise awareness and stated that black women need to pay attention to the silent killer because of the different risk factors associated with them. The event couldn’t come at a better time as it is both Fashion Week and Heart Awareness Month. In fact, 1 in 3 women will be impacted by heart disease and every 80 seconds a woman passes away from heart-related complications. 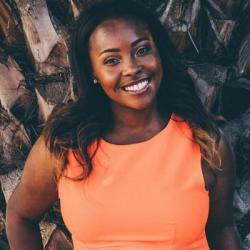 That is why at this year’s Women of Power Summit we are partnering with the AHA to help women go red and get fit with fitness expert Uti Middleton who will be teaching women new ways to prioritize their heart health. Hall was excited to be in the room and raise awareness as a black women who has family and friends who have struggled with their health and says that women don’t have to wait until something is wrong to go to the doctors. “I felt a weird murmur a few months ago and I went to the doctors and I talked about it and he recommended me to a specialist. I was in the clear but I did that and that was necessary for me to know that I was fine, thank God. But, the unfortunate truth is that some people may go and find out that everything is not fine but at least you know and you can do something about it,” said Hall. Listening to your body and staying on top of your heart health is key, especially for black women. “One of the things that is really unique about women is that often we don’t recognize when there are problems with our hearts. So I would say that it’s important to not only to pay attention to prevention and make those small changes and making the changes in your diet but to pay attention to when things aren’t quite right…and recognize those signs and symptoms and seek out medical care,” said Dr. Cook. Interestingly enough, Whitfield comes from a family of physicians and she says that while her family was more focused on medicine she is more focused on taking responsibility over her health for the best outcomes. Hall also takes her heart health extremely seriously as a black woman who knows that she is at risk. “African American women are the group least likely to name heart disease or a stroke as a concern. For women, the truth is, it is. And, as an African American woman I think that that’s something that we should know,” said Hall. A huge part of taking care of your heart is to take good care of yourself which means that you have to put yourself first. “Women tend to take care of their children, homes, and community before they take care of themselves and we want them to understand that you can’t take care of the community if you don’t take care of yourself,” said Surgeon General Adams. Some of the ways that Whitfield practices self-care is by putting herself first, eating right and exercising. “You know what I’m finding out? I’m finding out that I really don’t do as well at everything else if I don’t pay attention to those areas, you know? She also has modified her diet to be about 30% raw and she has taken on a holistic approach to living. “I have nice program of fitness and a trainer who is a mature woman who is really helping me to integrate it in a way that I can really keep up with it and I also try to keep my psyche and my spiritual life going in the right direction,” says Whitfield. Hall also has incorporated more exercise into her daily routine and cut back on junk foods which she says wasn’t easy and schedules time to be by herself. “I’ve learned in the last few years that it’s the most important thing because you cannot pour from an empty cup and I had nothing left to give and I was ready to burn out and I realized that if you can’t even enjoy the fruits of your labor then what is the point in the labor? So, I carve out time for myself the same way that I carve out time for my friends for brunch, or for my business meeting, or for an office meeting with my boss. And the same way that it’s from 2pm-3:15pm… If someone hits me up and says ‘let’s get drinks at five…I say, ‘I can’t I’m busy.’” said Hall. Little steps toward heart healthiness will take you a long way. Surgeon General Adams says that just 22 minutes of exercise every day which adds up to be two and a half hours of exercise a week can make a big difference in your heart health. Avoiding or decreasing your intake of tobacco, scheduling regular appointments with your physician and limiting the amount of junk food you intake can result in a healthier lifestyle. In raising awareness about heart disease for women Whitfield, Hall, Surgeon General Hall and Dr. Cook have all been transformed by their work. And, they encourage all women to listen to their hearts, learn their heart health numbers and take preventive measures to ensure their health. “This work has changed my life in a number or ways; as a father of a young girl who is at risk for heart disease, as a son of a mother who has heart disease, as a brother as a sister who’s at risk for heart disease it’s very personal to me. So I’ve been changed by knowing that we are at risk and I’ve also been changed by know that we can do something about it,” said Surgeon General Adams. If you want to take better care of your heart health and learn ways to prevent heart disease, join us and the American Heart Association at the Women of Power Summit.